Asian lady beetles are a pest that infests homes and other structures in the autumn, sometimes in great numbers, and overwinters in cracks, crevices and dark spaces such as walls and attics. Unfortunately, no natural long-term repellent for Asian lady beetles exists, but you can take other steps to control the problem. Camphor, a wax derived from the wood of camphor laurel or other plants, and menthol, an aromatic compound derived from peppermint, repel adult female Asian lady beetles. Camphor is the more effective of the two substances. Unfortunately, the repellent effects of these substances is short-lived, making them impractical for control of lady beetles infesting houses and other buildings. They may be useful to remove Asian beetles from a small area for a short period of time, however. The most effective way to prevent Asian beetle infestation of a structure is also the most labor intensive. The beetles infiltrate through cracks and crevices, so you can block them by sealing all possible entrances to your home -- vents, fascia, soffits, eaves, utility pipes, doors and windows are common points of entry. For an existing infestation, use a vacuum cleaner to remove large numbers of beetles at one time. Dispose of the vacuumed bugs outside. Spraying exterior walls with a pesticide containing pyrethroids before the fall influx of lady beetles is an effective adjunct to sealing cracks and other entry points. There is little point in spraying the area surrounding the house, because lady beetles travel from far away before hibernating inside structures. Pyrethroids, while not a natural product, are chemically similar to pyrethrin, a substance derived from chrysanthemum flowers. Pyrethroids differ from pyrethrin in their persistence, making them effective for longer periods. Asian lady beetles are a major nuisance in many areas of the United States, but they do bring some benefits. 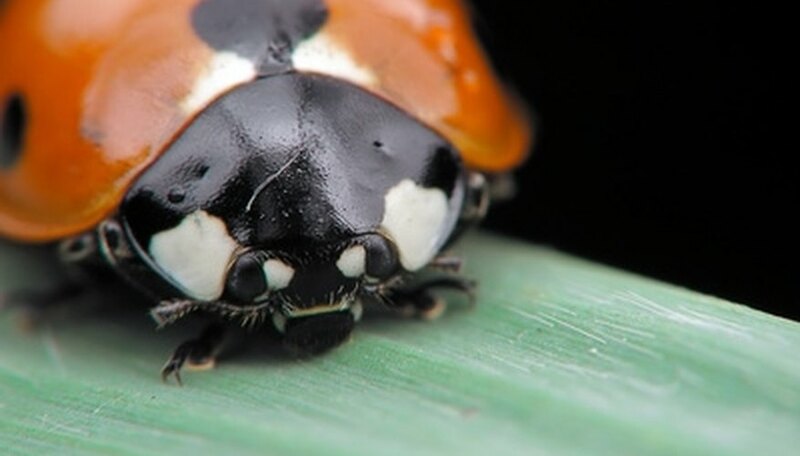 Like native ladybugs, lady beetles are voracious predators of aphids and other damaging insects. They do not sting and rarely bite, and they don't breed inside your house; all of the beetles that shelter in a structure and survive the winter leave again in the spring and spend the next several months living outdoors.